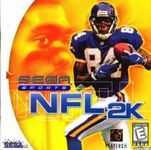 NFL 2K was the first game in the NFL 2K series of football video games. It was a Sega Dreamcast exclusive, and was one of the 17 games available on the Dreamcast launch date in the United States. The game was poised to be the replacement for EA's Madden series after Sega was told that no EA games would be made for the system.